Mike Brundage from Pennsylvania is the proud owner of a very special machine. That very special piece of automotive engineering comes in the form of a classic 1958 C1 that has been turned into a modern day wonder. Many Corvette purists cringe when they hear the word "resto-mod" . The purists be damned the new breed of rest-mod cars are taking the Corvette world by storm. Imagine having the looks of a classic with the power and reliability of a modern sports car. Mikes father purchased the car in 1988. It was a wreck and he intended to restore the car back to its original condition. The car was originally equipped with a 290hp fuelie with the electric convertible top option and a 4 speed transmission. The problem was the engine was seized, and the Rochester fuel injection was missing when he purchased it. Mikes father planned on doing the restoration himself. He disassembled the car and began work on the frame and worked on the frame for awhile before it got put on the back burner. Needless to say he never finished the car. When he passed away Mike asked his mother for the car so that he could finish it. 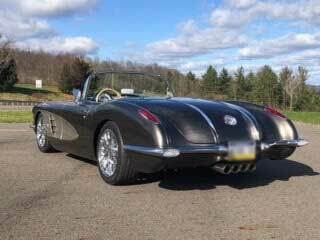 Mikes plans were to honor his father’s wishes and do full restoration back to original specs. When Mile brought the car to the build shop things changed very quickly. After going over the car with the builder it was decided that the best course of action was the resto-mod route. Thus Mikes journey into "resto-modding" began. With check book in hand Mike began purchasing the required magic parts that would enable the restoration. The project began with the purchase and installation of a complete Chassis Concepts, frame upgraded with C4 suspension and Dana 36 rear. After the frame was complete the decision was made to drop in an LS3 engine. The LS3 was the former resident of a 2013 Grand Sport that met an early grave. The motor was pristine with only about 3600 miles on it. With it being a Grand Sport motor they also decided to incorporate the dry sump into the build. The battery was moved to the trunk and the sump reservoir was placed in the space previously occupied by the battery box. The frame was then cut and channeled to accommodate the plumbing for the dry sump. The LS3 engine had some clearance issues with the front pulley system so a chrome Vintage Air LS front runner pulley system to solve our clearance issues. The radiator was upgraded to a Dewitt’s cross-flow unit with an electric fan. The engine harness is an OEM flashed GM harness . The engine was mated with an American Powertrain Tremec TKO 500 quick launch transmission. A custom exhaust with Magnaflow mufflers was installed. The quad exhaust tips exit under the license plate. LED brake lights were placed in the bumperettes where the original exhaust used to exit. The front clip was damaged and it was replaced it with a complete front end from Sermersheim. Z-bars were installed under the front fenders to get rid of the sag in the fiberglass. The only other glass work done was to contour the area under the license plate to accommodate the exhaust and removing the spare tire tub in the trunk. The car was painted galaxy gray with a custom mix gold for the coves. 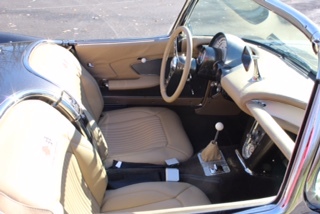 The interior and trunk were completely refurbished. The seats are embroidered with the C1 flags and C6/C7 lettering. This embroidery was also carried over into the rear trunk panel. A retro sound stereo system completed the interior. The car was finished off with C6 ZR1 wheels. The build took 5 years and many headaches but was worth the wait. Mike tells us that he ahas always been around Corvettes. On weekends his father always had some type of GM product in the garage. More often than not it was likely to be a C3 Corvette but the C1 was the holy grail for Mikes father and quickly became a favorite for him as well.